A 1991 single malt from Bowmore, bottled at 25-years-old for the second batch of the Antique Lions of Spirits Butterflies Collection. The nose is complex, starting with coastal, sea-salt notes with hay and seaweed. There are also gentle, fruity aromas of lemon, pears and gooseberries. The palate brings flavours of tropical fruits – passion fruit and grapefruit in particular – and a gentle peatiness. 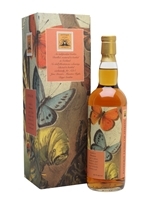 In a bottle with a distinctive butterflies label, the Butterflies Collection Bowmore is the perfect addition to any collection.